We’d love your help. Let us know what’s wrong with this preview of Claiming a Continent by David Day. A new and updated edition of David Day's award winning exciting general history of Australia from European settlement to the present day. By placing race at the centre of the Australian story and linking it to a broader narrative of possession, dispossession and proprietorship, David Day's book is an important and timely look at what has shaped Australia's history. To ask other readers questions about Claiming a Continent, please sign up. A fascinating look at the history of Australia, particularly focussing on the history of European settlement (/invasion) and subsequent race relations, both with Aboriginals and throughout the world. I found there was a lot I didn't know about the country and the motivations behind actions taken in the past. A great introduction to topics, giving me a feel for where I would like to learn more. David Day has written widely on Australian history and the history of World War II. 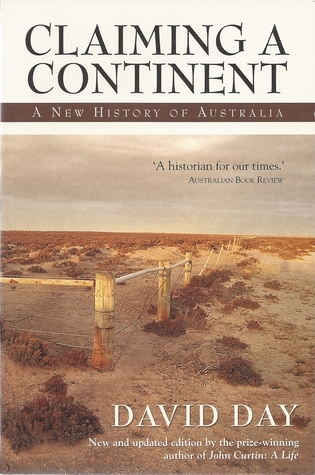 His biography of John Curtin won the 2000 Queensland Premier’s Literary Awards Prize for History and was shortlisted for the 2000 New South Wales Premier’s Literary Awards Douglas Stewart Prize for Non-Fiction, while his biography of Ben Chifley was shortlisted for the New South Wales Premier’s Award for History in David Day has written widely on Australian history and the history of World War II. His biography of John Curtin won the 2000 Queensland Premier’s Literary Awards Prize for History and was shortlisted for the 2000 New South Wales Premier’s Literary Awards Douglas Stewart Prize for Non-Fiction, while his biography of Ben Chifley was shortlisted for the New South Wales Premier’s Award for History in 2002. David Day is currently an Honorary Associate with the History Program at La Trobe University and a visiting professor at the University of Aberdeen. He lives in Eltham, Victoria.